Titles of films for sale include "Transmorphers" and "Death Racers"
CANNES, France (CNN) -- It rained in Cannes on Friday, and for that, Michael Mendelsohn was thankful. Though the red carpet gets all the attention, the Croisette -- the shore road -- is where many deals go down. "My father always said if you want to sell something, do it in the rain," Mendelsohn told CNN. "People are focused on buying in the rain." Mendelsohn, the chairman of Patriot Pictures, is one of the many people who arrive in Cannes not for the glory -- the red carpet, the paparazzi flashbulbs, the artistic debates -- but for the commerce. He has three films to sell, and he's hoping to make a deal or two. "It's the greatest show on earth," Mendelsohn said of the atmosphere. 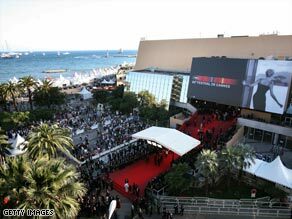 Industry players such as Mendelsohn come to the Cannes Film Festival for something called the Film Market, which runs at the same time as the festival. It's a kind of international bazaar where films of every description are bought and sold. Among the titles at the Film Market: "Death Racers," "Mega Shark Versus Giant Octopus" and "Transmorphers: Fall of Man." The latter, which stars Bruce Boxleitner -- you may remember him from "Scarecrow and Mrs. King" and "Babylon 5" -- is a sequel to a 2007 straight-to-video release, "Transmorphers." Neither film is related to "Transformers" or its sequel, "Transformers: Revenge of the Fallen" -- though the title is probably not a coincidence. It may seem like a joke, but it's deadly serious for participants. "The Cannes market is the most influential market. Buyers that don't participate in Berlin or AFM [American Film Market, a haven for independents] will be at Cannes," David Robinson, partner of Elephant Eye Films, told Variety411.com's Marjorie Galas. Deals can be consummated in the stalls of the Film Market or in hotel rooms spread around the city. The Croisette -- Cannes' Mediterranean-fronting main drag, which is lined with hotels and restaurants -- is ground zero for buyers and sellers. The process can be brutal. Besides the basic effort of setting up at Cannes -- complete with technological hassles and spread-out staff -- there's the need to attract possible buyers to screenings. That's not easy with the fierce competition. Mendelsohn told CNN he's had a good festival so far. One of his films, "All's Faire in Love" -- a comedy about Renaissance fair rivals, starring Christina Ricci, Cedric the Entertainer and Ann-Margret -- is "close to closing 3 million dollars in deals," according to Mendelsohn. Another of his films, he added, may do double that. But he's not going to rest. "Three movies, one market," he says. "That's a lot of walking up and down the Croisette."